Founding of the Library . . . . In the autumn of 1874 a man said to his wife, "we ought to organize a library association in this county at once." After much discussion back and forth with his wife thinking the whole time her beloved book collection would come to a perilous end if the association ever became a reality, the subject was dropped. Old O'Brien residents started the library group which came to be known as the General N.B. Baker Library Association. William Huston and Roma Wheeler Woods spearheaded the effort. For several years leading up to its incorporation residents had been moving from the old town located west of Peterson. In 1881 Roma Wheeler Woods relocated both the association and the libraries contents (1100 volumes) to her family home on the corner of 2nd and Oak streets. With the passage of Town Ordinance No. 40 the library association was recognized by the city and a seven member board of trustees was established for its governance. 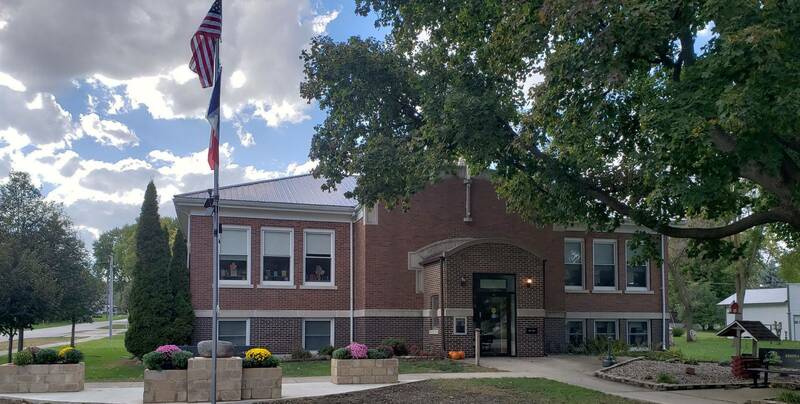 The city of Sutherland purchased the present building from Sutherland Consolidated Schools for $6000. "One hundred years ago this fall the Gen. N.B. Baker Library was started in a small log cabin. In the beginning it was only a few shelves at one end of this cabin, which was also the home of Mr. and Mrs. William Houston Woods. The few shelves held $39.00 worth of books and magazines." A massive renovation of the library took place which involved among other things putting in carpeting, a handrail and starting to make the building handicap accessible. Renovations started in 1989 are completed with the installation of an elevator which made the building fully handicap accessible. Like so many homes and businesses General N.B. Baker Library was flooded by the disasterous rain. Many historical items and other library property was damaged or destroyed by the floodwaters which reached several feet high. "The General N.B. Baker Library is the eighth oldest in the state. It is a fully accredited library and is handicap accessible. " Serving the area since 1874. In the autumn of 1874 a man said to his wife, "we ought to organize a library association in this county at once." After much discussion back and forth with his wife thinking the whole time that her beloved book collection would be in peril should the association become a reality, the subject was dropped. The General N.B. Baker Library Association was started by William Huston and Roma Wheeler Woods of Old O'Brien to serve area residents. People came from miles around to get books and magazines to help pass the isolation of the cold Iowa winters. Started with a few books collected from area residents in time it grew in no small part due to the assistance of General N.B. Baker who sent the library a great many books at the request of his friend William Huston. Such was the General's success in getting subscribers to the library that a few years later bookshelves were added to the cabin and eight magazines were ordered (Littel's, Harper's, Scribner's, St Nicholas, Agriculturist, Galaxy, Arthur's Magazine and Peterson's). The following year many of General Baker's friends learning of the fledgling library began sending books and magazines. Boxes were received from New York, New Hampshire, Davenport, Des Moines and Moline to name but a few. In the year 1876 though disaster struck when grasshoppers filled the air nearly bankrupting many local residents. In fact when it came time for the annual subscription only two area residents could afford to do so. Despite that though the library remained open providing books to financial strapped patrons. It was in 1881 that the library was moved to Sutherland residing in the Gracey residence, Louthan and Price Store and at the Courier office where it remained until 1916. It was in that year that it moved to the building across from the park where it is housed still today. Roma Woods was one of the founders of the library and for many, many years was the backbone of the library association as well as serving as both librarian and hosting the collection in her personal reference. Originally from Ohio Woods died in her home in Sutherland in 1916. It was not until her will was read that area residents found she had left the library association funds with which to purchase their current building. To this day the Woods Memorial Building is permanent home to the N.B. Baker LIbrary Association. Formerly the Governor of New Hampshire moved to Iowa in 1856. 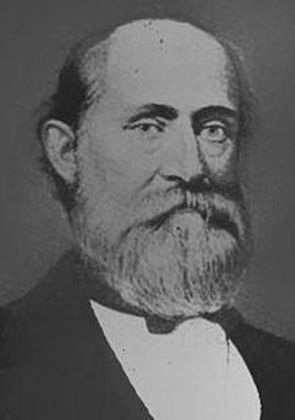 An Iowa state legislator and during the Civil War Adjutant General Baker at the request of his friend William Huston Woods was instrumental in the early growth of the library association.